All my life I’ve been told I’m ‘blunt’, or ‘matter of fact’ or maybe ‘direct’, depending on whether the person saying it is trying to be blunt themselves or in fact trying to spare my feelings. Or as my father used to say, ‘You don’t suffer fools gladly’. It wasn’t something I was aware of as a child but as I grew older I became aware that I’m not blessed with tact. For a while I thought this was actually an admirable trait as in, ‘I always spoke the truth’ - until as a teenager I discovered alcohol and realised that I actually upset people sometimes - genuinely and honestly not my intention. You see, I never meant to upset people, sometimes I just didn’t think. I was brought up to be polite. I was brought up in one of those middle- class English homes where nobody actually says what the real problem is, if they have a problem with someone that is. Resentments can last years, forever even, but God forbid you don’t actually say what’s bothering you. No, it was far better in my home to simply say nothing and maybe sulk and hope the other person would work it out eventually. The one thing my family never did was confrontations, I think my poor father would have rather put up with anything and he certainly did put up with many things over the years, rather than say that something or someone had upset him. Anyway, I was brought up to be polite and so in many ways I am. I always thank people for their gifts, writing thank you letters was essential and I always, always did that and still do, regardless of the gift and I always, always make it sound completely genuine, the best gift imaginable, so well thought out and entirely appropriate. The poor person would never know that I hadn’t always wanted it and might in fact give me something very similar the next year being as it was something I had always wanted. The same went for food, we ate what we were given, we smiled, we said we liked it, we accepted more even. This was how we were and still are and incidentally it still grates with me when my son’s friends happily and casually say they don’t like certain foods, it’s simply not how I was brought up. This upbringing though of course conflicts greatly with what I believe is my innate personality, my natural desire to be honest, blunt, matter of fact, direct, whatever you want to call it. And so I have tried, honestly I have tried to be polite all my adult life. Sometimes I fail but 99% of the time I don’t upset people any longer. Rarely do people call me direct nowadays (though my partner recently said that I was a natural born northerner – whatever can he mean?) I listen to what people say, I stifle my natural urge to ‘tell them the truth’ and I say what I think they want me to say. I have learnt this and I consider it one my achievements. I have never been rude or even honest about food (I am quite a foodie), no that was far too ingrained in me but would I have had to suffer the Duck à l'Orange not once but twice if hadn’t actually been quite so polite? I’m not sure. Last year I went to stay with a dear friend, someone I see very rarely these days because she doesn’t have children and doesn’t have space for me and my boy and doesn’t live nearby. So I visit her only when I don’t have him. Obviously, being a single parent this is rare occurrence but when I have time without him I make the most of it and I visit friends like her precisely because they happen so rarely. So, I travelled to her house and she told me she’d cook. ‘Great’ I thought, I wouldn’t eat and I arrived hungry. Now if you saw her kitchen you’d know she didn’t and probably couldn’t cook, sparse is a polite way of putting it. There’s barely a kitchen implement, the walls are bare and the room is dark. Not that you need light, decorations and many implements to cook but it isn’t inspiring. But still. She told me she’d cooked Duck à l'Orange but I couldn’t see evidence of any cooking and nor could I smell it. Now how to describe it? 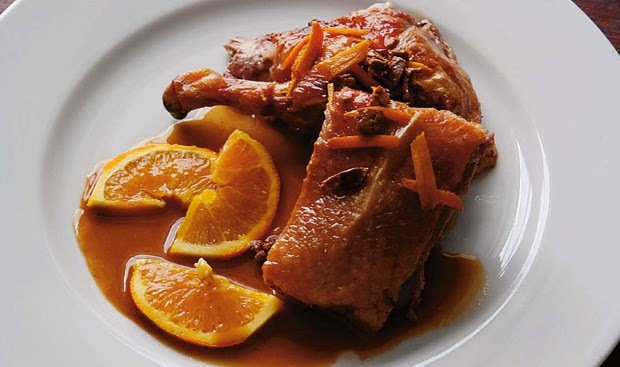 Imagine if you will taking a duck and boiling it for perhaps several hours in a few pints of orange juice and serving it, nothing more – that was it. It was very, very boiled duck in orange juice and oh there was a slice of orange on top. As I said, I am naturally honest, direct, matter of fact but I have brought up to be polite so when she asked what I thought, I wrestled hard and I fought the urge not to tell the truth or say that I couldn’t eat too much as I was on a diet, had eaten first, had a small appetite, didn’t eat much meat, anything…No my upbringing won and said that it was quite delicious, quite the best thing I’d ever eaten and I asked for the recipe. And so she told me and that’s how I know the simplicity of the dish and how long it was boiled for and more than… that I ate seconds. I’m sure she was quite complimented. Perhaps she served it to other friends who were equally as well brought up as me, who knows? All I know is that almost a year to the day I went to stay with her again. And this time I urged her not to cook but said I’d eat on the way and I did, I ate a sandwich before arriving, I made sure I wasn’t hungry. What else could I do? I arrived feeling pleased to see her but pleased that I wouldn’t be eating but looking flushed and with a smile on her face that said she’d been hard at work she told me, ‘I’ve made you a surprise, seeing how much you liked it last time, I’ve cooked you Duck à l'Orange again!’. And the lesson from this is what? To be blunt, to offend, to lose friends or to eat the Duck à l'Orange twice? Something I haven’t yet learnt, maybe I will someday… (I did eat it, slightly less enthusiastically the second time by the way).